Alan Byrne has written a fine and detailed account of all the Thin Lizzy albums (both in the studio and live). In doing that, he has in effect chronicled the life and times of the band and covered the various issues that surrounded many of the band members. A highlight for me is the number of key first hand interviews the author has carried out and included in this book – nearly all the band members (save for the great Phil Lynott himself obviously) and many of the producers/engineers/road crew that made the band great. Keeping on message though, the book diligently covers the key tracks from each album with lots of descriptions on how the song changed from its demo form, who did the solo and the general mood of the band at the time. Clearly a huge Robbo fan, Byrne gives all guitarists their due - Snowy White, Gary Moore, Scott Gorham and Robbo himself and also includes quotes from the first guitarist, namely Eric Bell. The book tells of the audition of Darren Wharton where in preparation he had actually learnt every Lizzy song (just to be sure of getting the gig, I presume). The song-writing and in particular lyric-writing of Lynott is discussed in depth – at his best the book declares him a genius but in latter days the author would appear to be slightly less enamoured with some of his offerings. 'Jailbreak' is seen in the book as the zenith of the band, augmented by the later 'Live And Dangerous' and then the real magic was over. The book testifies though that as the band were such good musicians, things never got bad – just not as good as before with just a handful of songs per album having the wow factor. 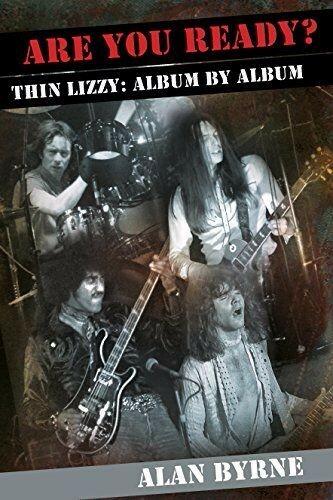 The overall tale of the band is quite well known already but with this clear focus on the band's recordings, this book has a valid and well-deserved claim to be a key book regarding Lizzy.